So after writing Down Where It’s Wetter, I’ve kinda become obsessed with the blue ringed octopus cause it’s an adorable and deadly creature (like me!) Then out of the blue, @hotsauce418, that master of mayhem and mischief, comes at me with what can only be described as THE BEST IDEA EVER. IS WISE! LISTEN TO THE POSSUM! who’s Mer!Hannibal comic is one of my very favorite things! NOW LOOK AT THIS CUTIE! Thank you @bayobayo! I love him so much! Y’all should definitely consider commissioning this fantastic artist or supporting them on Patreon. Their art is joyful and fun and oh so beautiful. It always brings a smile to my face. 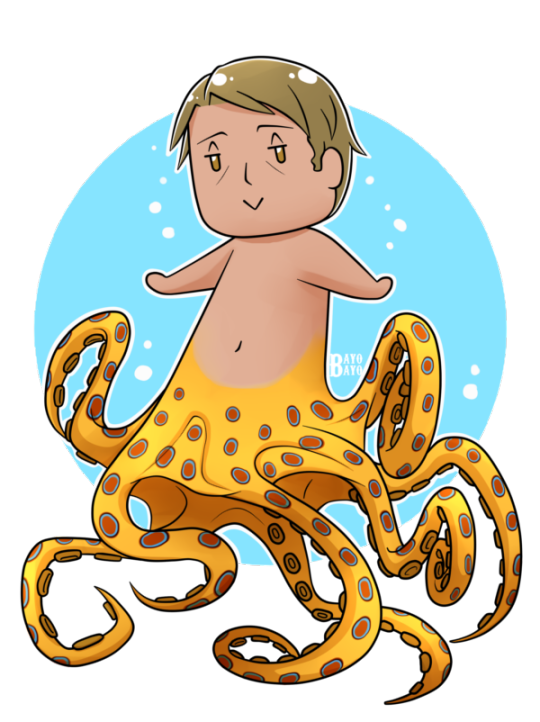 Cephalopod Squad: I know you guys aren’t all in the fandom, but look at this totally adorable Hannipus/Mer!Hannibal! !